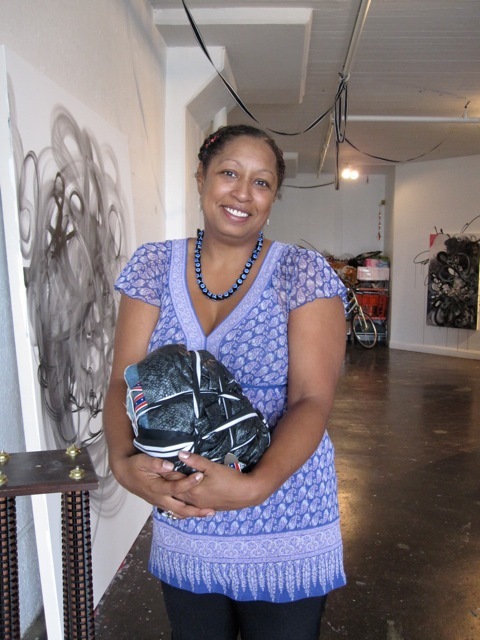 I visited artist Shinique Smith at her studio just before she left for Miami to install her show at MOCA North Miami, a survey show that opens this Thursday. 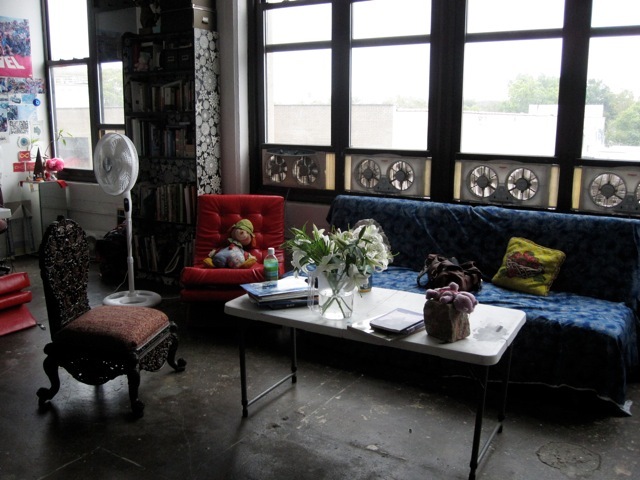 Her studio is in a converted factory just south of the Brooklyn Navy Yard in Fort Greene, Brooklyn. It's not the easiest studio to get to but when I arrive I can see the allure: It's massive, bright and quiet -- an overall a pleasant place to be. 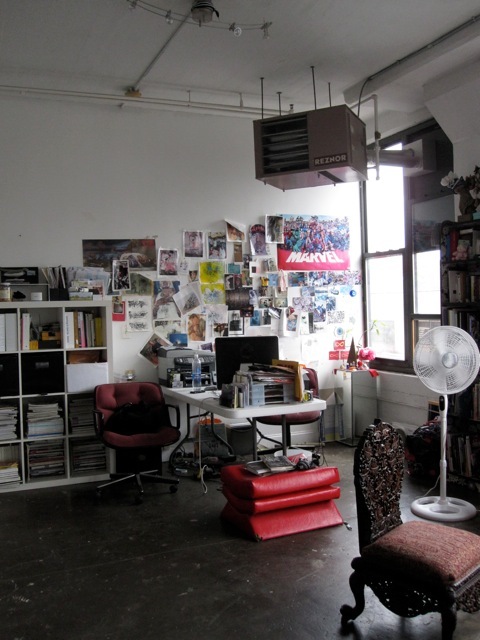 I learned later that the building also houses the studios of artists Rita Ackermann, E.V. 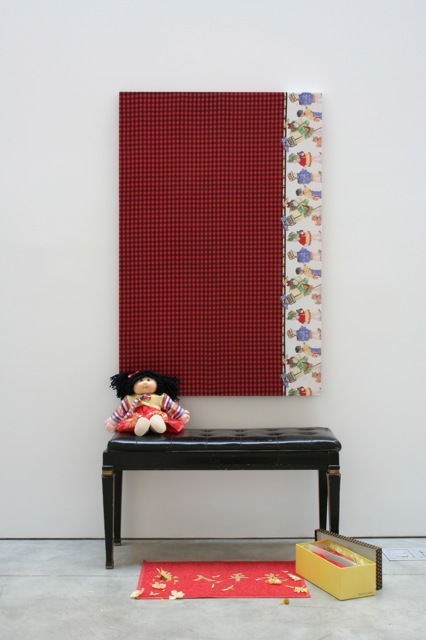 Day and Mickalene Thomas. 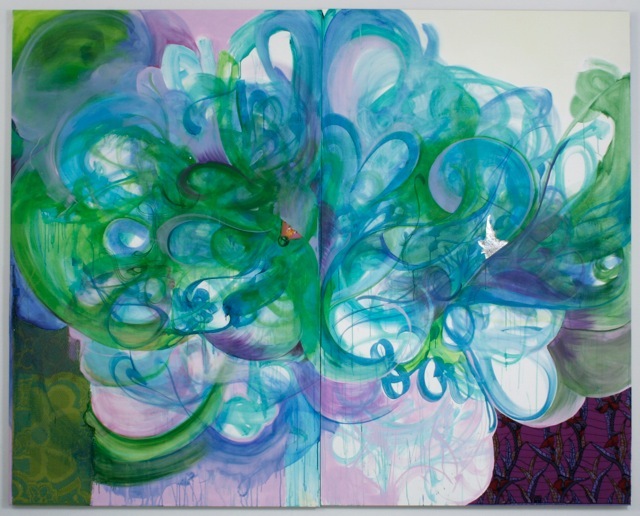 I first saw Smith's beautifully energetic paintings and textile works at Yvon Lambert in the summer of 2009. I encountered her work several times since then, most recently at Portugal Arte10, in a show curated by Johannes VanDerBeek. 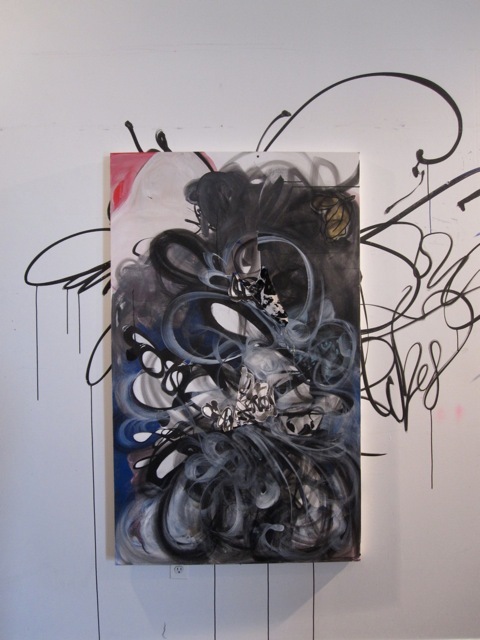 Smith's paintings are incredibly stylistic and lyrical--squiggles and other staccato marks that jump off the canvas, alongside textiles and found objects that Smith incorporates on to the canvas, that literally jump from the surface. 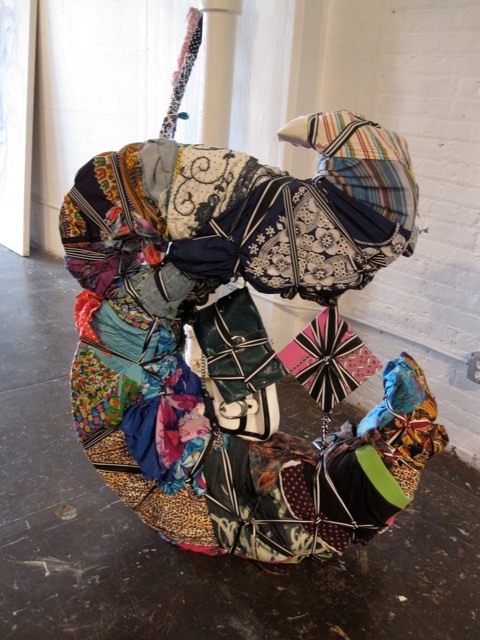 Her stacked textiles are carefully constructed and incorporate both a formal approach to color and pattern as well as a comment on consumption and branding. 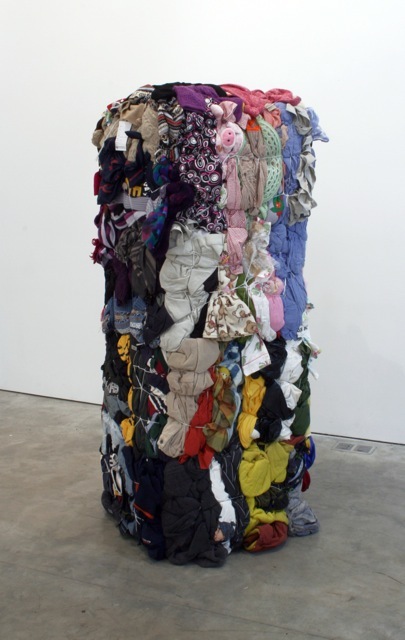 She ties and mounts or stacks the textiles in such a way that it feels like an intricate puzzle. Her relationship to color is both bold and gutsy and soft and elegant all the same. 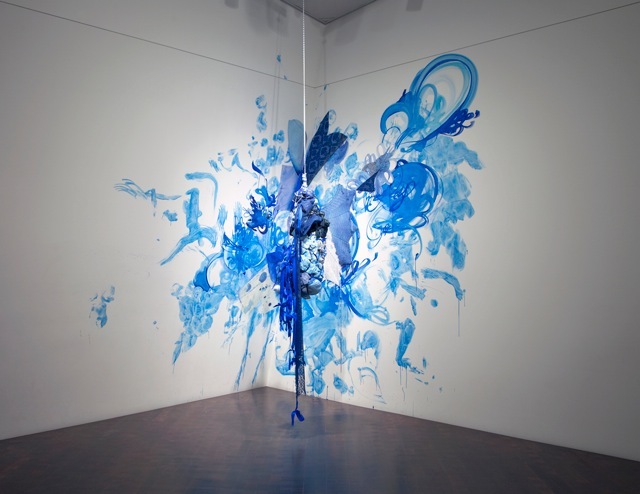 Smith has beautiful movement to her work, whether on canvas or in the form of sculpture or installation. Her studio was amazingly tidy, two long shelving units brimming with textiles, all sorted by color and pattern. On top of one shelving unit were a few plastic dollhouses that looked like they were circa the '80s, as well as dolls and other interesting bric-a-brac. The place was a treasure trove of toys from my childhood in the '80s -- Care Bears, teeny bopper magazines, Strawberry Shortcake paraphernalia, My Little Pony plastic ponies, and more. 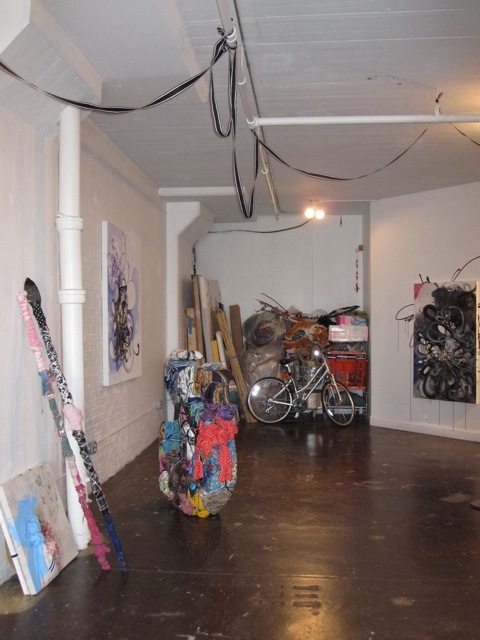 It felt almost like a tidy thrift store on the interior of the studio while the periphery of the studio was a lot more spacious and almost stark, lined with works in progress. Most of the not-yet-completed works that I saw will go to the Southeastern Center for Contemporary Art (SECCA) for a show opening in November. Marina Cashdan: So at this point you're finished preparing for the MOCA show. Shinique Smith: Most of the works are borrowed because it's a survey show. MC: So there won't be any new works in the show? MC: ... All found textiles? SS: Some found and some created. Some of them are these triangular sail shapes that I've dyed and painted integrated with other found things from different places. MC: Was it difficult or easy to work with the architecture of the museum. Did you get to make a couple site visits? SS: I did one site visit and took photographs and most of that is helpful, as well as seeing floor plans and things like that. But it's not going to be completed until I'm in the space. Within that installation, I'm hanging several works from the last few years, which are hanging pieces, so it kind of meanders through the space and incorporates all these works. MC: How far back do the works go? SS: To 2002 when I was in grad school. MC: So have you seen many of these works since you sold them? Will it be a strange re-meeting of the early part of your career and your practice now? SS: I haven't seen many of those works since [I created them]. Some of them left immediately after they were finished. MC: Is there anything that you worked on earlier in your career that will be shown for the first time, which perhaps was bought directly from the studio for a private collection? 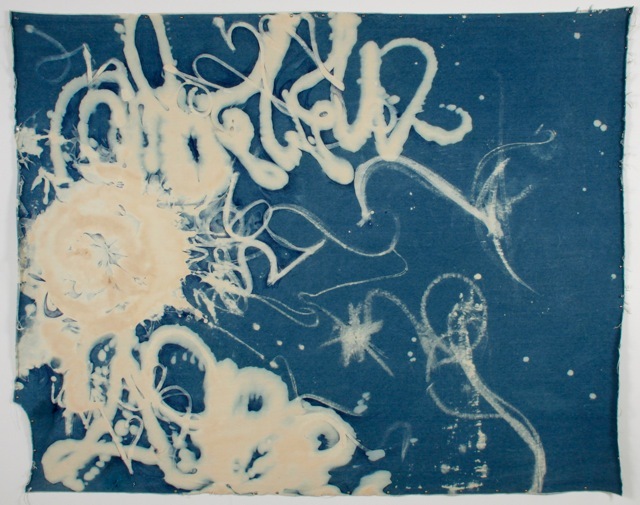 SS: Yeah, one of the pieces in the show I had in my thesis but I haven't shown it out in the world. MC: I always wondered what it felt like for an artist to invest so much of him- or herself into a work and then have to let go of it, sometimes to never be seen again. Is it hard to let it go or are you resolved when you finish and sell the work? Is it more about the journey of the creation? SS: I'm somewhere in between. I'm not so attached to the final product but I'm attached to the process of making it. I don't want to surround myself with my work because I think it could lose energy if it sits around too long only living through my eyes. It needs to go out and have a life. But then there are pieces -- and several in the show -- that I have wondered about for a while, you know, favorites that I look at images of and I'm like, 'Oh, I'd like to see that again.' It will be interesting to see if I still feel that way. MC: And what are you working on now, something for a particular show? SS: I have a show in November at the Southeastern Center for Contemporary Art in North Carolina, in Winston-Salem. So these panels here -- not the blue but these here toward the back -- are for this show. There will also be some borrowed works in the show as well. MC: I saw your work Bale Varient No. 0015 (2009) at Portugal Arte10 in the "Personal Freedom" exhibition -- a stacked fabric work. I wondered how you constructed those works? And what is the process of decision-making that takes place when creating them, because they're quite complicated? It looked like every piece of fabric, and particular visible labels or brand names, are placed very carefully and thoughtfully. The works aren't just thrown together. SS: That's good! Well, I approach them the same way I do my other works, sort of a collage way of thinking about formal relationships as far as color and pattern. And then there are these little details like a silkscreen on a t-shirt that pertains to the planet. Sometimes it's random. I want it to be a combination of my orchestration but also be random. I don't want it to be too heavy handed. MC: As a viewer you start to make your own associations, whether you as the artist intended them to be there or not. The viewer almost owns it in that way, whether it is a formal association or more representational. SS: My hope is that my work is open enough that one can do that. I make my own particular associations according to my experiences of the world and everyone else brings their experience and judgment to looking at it. MC: There's a particular energy to all your work, vibrancy. What's the origin of the fabric works? You obviously collect fabric and t-shirts and dollhouses! 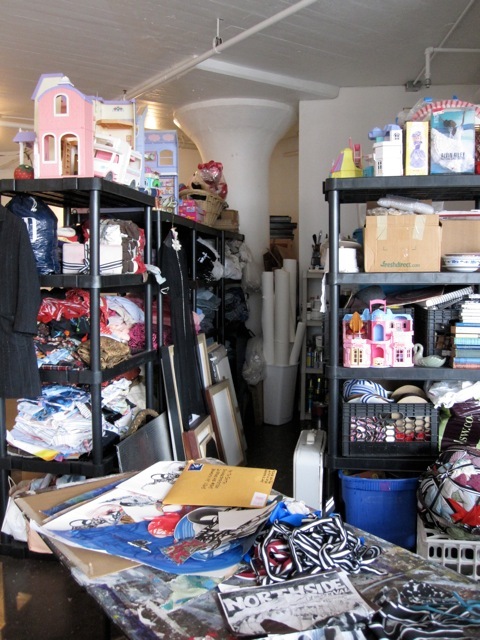 It almost looks like a thrift store -- albeit a very organized one -- in the center of the studio. It's a fascinating studio to visit. Have you always been interested in textiles and toys and such? SS: Well, you know when I was a kid, my mom designed clothes. She was a fashion designer. She studied here and in Paris. She would take me in and out of fabric stores and I really hated fabric stores when I was a kid but then at the same time, I was kind of fascinated. There were troves of [fabric] bolts. My mother had this love of fabric that I absorbed. 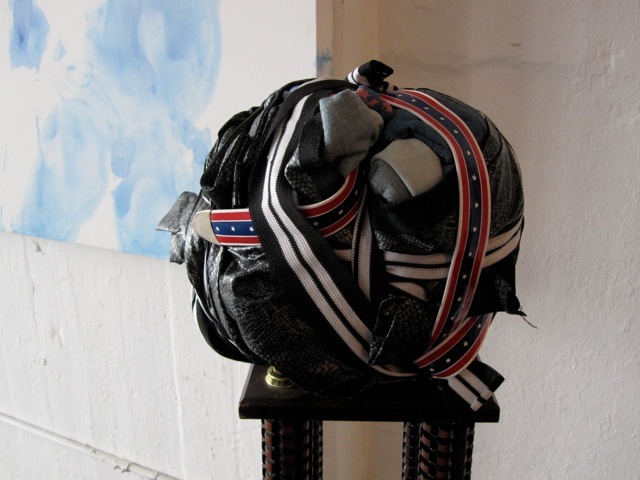 But I didn't work with fabric or sculpture until 2002/2003. 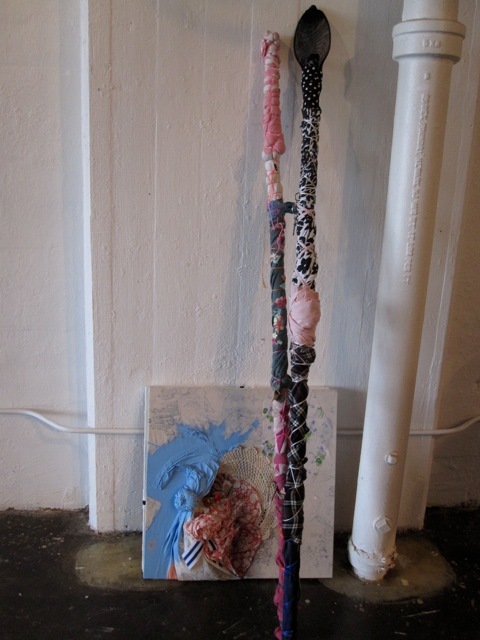 Or I guess I was using textiles but more as a surface to paint on -- for example I used vinyl and denim. But it seemed too flat and it wasn't until I was here [in New York] and started reading about the exploitation of used clothing and the bales that get shipped off that I explored textiles further. MC: You mean the bales of used clothing from organizations like The Salvation Army? SS: Yeah, I read this article by this woman who gave away this t-shirt with this altruistic notion that the money made from selling the shirt would go to someone less fortunate. And the second-hand shop that she gave it to on the Upper West Side couldn't sell it because it turned pink in the wash. 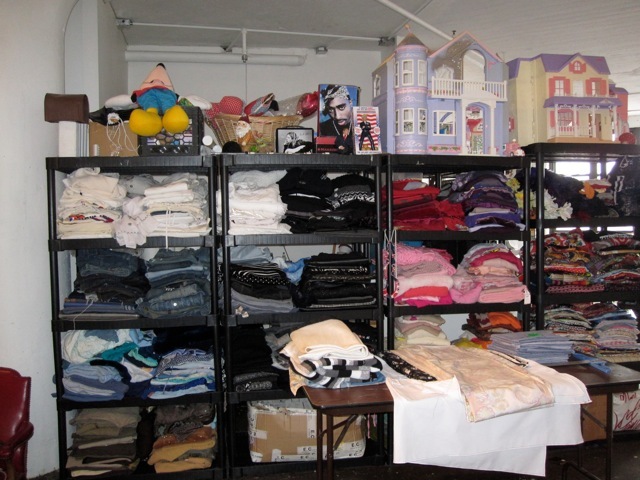 So there's a company in Greenpoint [Brooklyn] that buys the unwanted clothing; and when they get shipments, they grade everything from A to D. For example, gently used things and really crappy stuff get separated. And then they send it to different countries, the crappier stuff going to poorer countries. The woman's t-shirt was graded highly basically because there was a university logo on it. So there's an idea associated with what we wear elsewhere in the world -- of American life. But there was also this connection between this woman and the man [who eventually got the shirt] through commerce. And then living in New York -- I live here in Brooklyn -- you know that if you put out shoes or magazines, someone will take them. And then we're connected somehow through these things. And then I started thinking about the psychology of this. What we wear -- we're represented by our clothes, like costumes. So at first I wanted to try to make a bale. But I'm not a machine and lot of the materials started to dictate the form. MC: You use rope and twine and ribbon to hold all the clothes together. Is there some sort of underlying foundation or infrastructure? SS: Not usually but with the bale structure -- like the one that you saw in Portugal, it has a wooden infrastructure and part of that is because when clothing is condensed it becomes to heavy. I had a bale on loan for a show I did at the Boulder Museum of Contemporary Art. I wanted to purchase a bale as a readymade but they don't sell you just one. You have to buy a trailer. So they loaned it to me for the show. And it weighed 800 lbs. The wooden infrastructure allows the sculptures to be moved. Also, tethering things to the wood panels allows me to orchestrate things, where they fall next to each other. But other sculptures are solid and are very heavy! MC: Let's walk around your studio and look at what you're working on now. 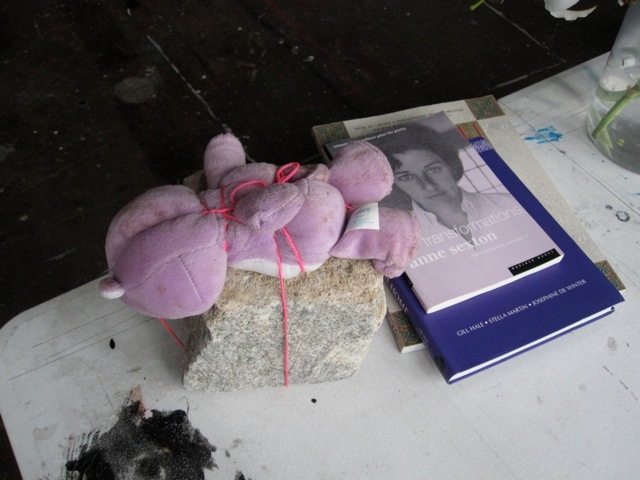 MC: Is this a Care Bear tied to a piece of concrete? SS: Yeah, it's Share Bear. MC: Ah, yes! I had Care Bears growing up. MC: I must say, it's very organized in here, even color-coordinated. SS: That helps my eyes. And then when I'm thinking that I need a particular color ... or if I need stripes, they're all arranged. It makes more sense for me. SS: I'm working on this one now for that show in November. It's at a beginning stage. I recycled this one. 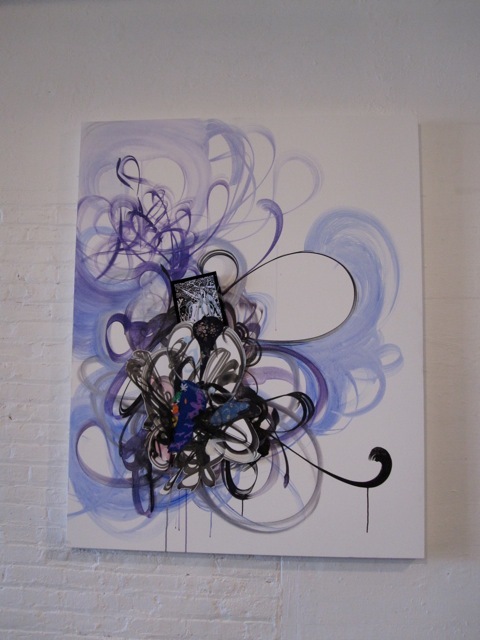 The collage is from an installation I did in Illinois. So I'm recycling my own work constantly. This piece I'm reworking was made in 2007 and I just started painting over it. MC: Had you started working on it and then put it aside and revisited it later or at one point did you think it was complete? SS: It was actually in a show. But when it was returned to me, I wanted to work on it again. MC: Do you do that often? SS: Not super often. Most of the things that leave are finished or resolved but there was an energy that didn't feel complete. Recently I've been thinking a lot about loss. I didn't lose anyone recently but I almost lost my grandmother, though she's doing really well now. But I found this book earlier in the summer called Eros In Mourning. It was talking about how the second you obtain something meaningful you have a fear of losing it. So I've been thinking about that and embracing it. And also thinking about how each piece I make is a journey -- both a personal journey and a formal journey that hopefully you see traces and there's a sense of discovery at the end of that journey. But I started thinking about these works. Perhaps I start at the center of that journey sometimes -- somewhere in the middle instead of the beginning. I've been working with this piece trying to explore that. MC: And when you, for instance, use a found object or found material, that material has its own former history and past journey as well. SS: Even the new items have a history just in the making of fabric. What it's made out of, the colors associated with it. 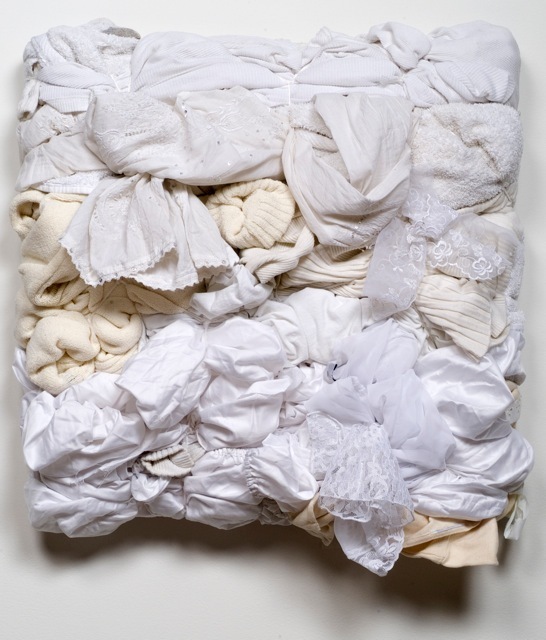 MC: As your mother is in fashion, I wonder how she feels about your work and your relationship to textiles and color? SS: She was in fashion but now she's a life coach. But she likes the work. She was actually here recently helping me sew some things. I wanted to edge some of the things for the ceiling piece [at MOCA]. MC: Do you have an (or more than one) assistant as well? SS: I do have an assistant and he helps but not really with work. So much of my work is about my touch. It's difficult on one hand because everything has to emanate from me. MC: Are there times when you feel drained or on empty, so to speak? When that happens, how do you get over it? SS: I think about making a work for the most part; every once in a while I go away. Sometimes you have to step away from a work and come back to it. MC: When you start a work, do you have an idea of how you want it to look or does it often take a life of its own and surprise you? SS: Ninety percent the latter. It's more interesting for me not to plan and sometimes you wind up repeating the same gestures and then there's this backing up and editing process where I try to break that up. I've done sketches and plans for potential ideas -- like sculptures and installations -- but for the most part, it's allowed to change in the process. MC: Can you talk about this basketball trophy piece. Is it a found object? 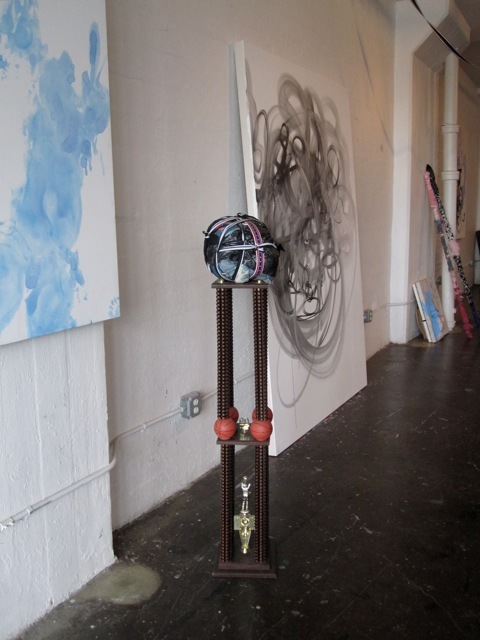 Smith with one of her works and its basketball trophy pedestal. SS: It is. One day I was walking down the street and found it. And it's very American and it became a perfect pedestal for this piece, which is from 2003 or 2004. MC: Is this all fabric from somewhere in particular? SS: I think it is from different works. I've had it for a while and tried it. MC: How long have you been in this studio? MC: And are there many other artists in the building? SS: Rita Ackermann is one or two floors above me. And Mickalene Thomas, who is a friend, and E.V. Day are also in the building. MC: Do they ever stop in? SS: Every once in a while. But we all do a lot of traveling. In the end, we work here and we live in the same neighborhood more or less and so we bump into each other. MC: So what's your typical day like? How would you describe your method of working? SS: I usually come to the studio every day. I've been trying to distance myself, too. Sometimes I end up sitting at the computer writing correspondences, especially when there's a show like this [MOCA show] coming up. Sometimes I handle that first and then I work. But I'm trying to work first. Now I'm trying to get here in the mornings. When there's a deadline or a crunch, sometimes I crash here. MC: Do you find that you work better in the morning or the night? SS: I usually work better in the morning but often at 4pm I get my second wind. But there's something to say for being up all night and pushing past this physical barrier. And when there's no time to worry about certain details, like my own personal insecurities about the work. In that state, you go beyond that and it's all about just making it work. MC: Yes, you almost feel free and disconnected from those insecurities when you're that tired. It can almost be liberating ... but then you crash.